Important evidence for populations of intermediate-mass black holes (IMBHs) has been found. Using data from Chandra and other telescopes, two teams independently discovered IMBHs relatively nearby and billions of light years away. The detection of X-ray emission by Chandra provides critical evidence that IMBHs have been discovered. IMBHs may play a significant role in the formation of the very biggest black holes in the early Universe. This image shows data from a massive observing campaign that includes NASA's Chandra X-ray Observatory. These Chandra data have provided strong evidence for the existence of so-called intermediate-mass black holes (IMBHs). Combined with a separate study also using Chandra data, these results may allow astronomers to better understand how the very largest black holes in the early Universe formed, as described in our latest press release. The COSMOS ("cosmic evolution survey") Legacy Survey has assembled data from some of the world's most powerful telescopes spanning the electromagnetic spectrum. 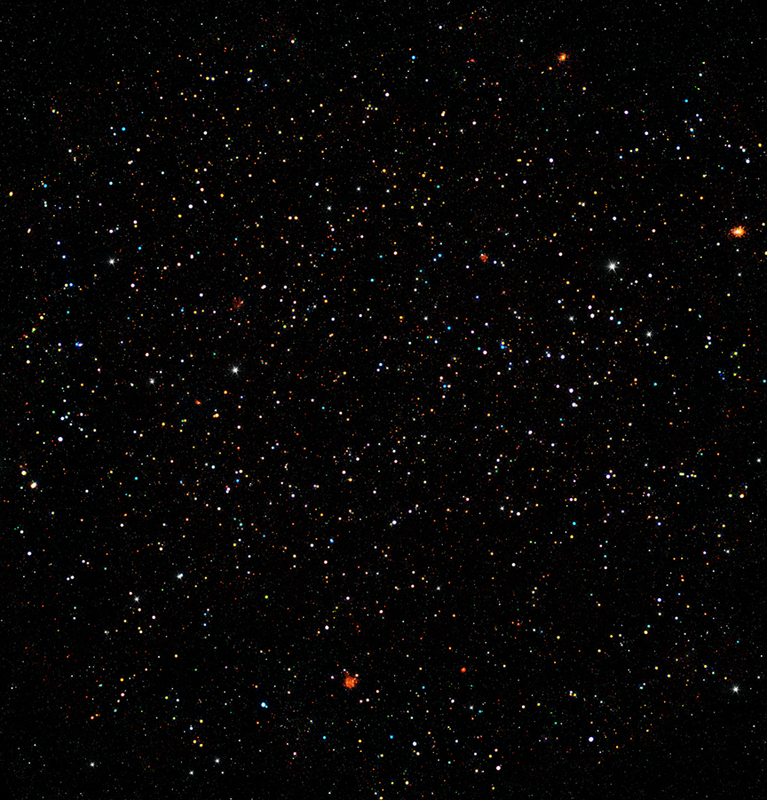 This image contains Chandra data from this survey, equivalent to about 4.6 million seconds of observing time. The colors in this image represent different levels of X-ray energy detected by Chandra. Here the lowest-energy X-rays are red, the medium band is green, and the highest-energy X-rays observed by Chandra are blue. Most of the colored dots in this image are black holes. Data from the Spitzer Space Telescope are shown in grey. The inset shows an artist's impression of a growing black hole in the center of a galaxy. A disk of material surrounding the black hole and a jet of outflowing material are also depicted. Two new separate studies using the Chandra COSMOS-Legacy survey data and other Chandra data have independently collected samples of IMBHs, an elusive category of black holes in between stellar mass black holes and the supermassive black holes found in the central regions of massive galaxies. One team of researchers identified 40 growing black holes in dwarf galaxies. Twelve of them are located at distances more than five billion light years from Earth and the most distant is 10.9 billion light years away, the most distant growing black hole in a dwarf galaxy ever seen. Most of these sources are likely IMBHs with masses that are about 10,000 to 100,000 times that of the Sun. A second team found a separate, important sample of possible IMBHs in galaxies that are closer to Earth. In this sample, the most distant IMBH candidate is about 2.8 billion light years from Earth and about 90% of the IMBH candidates they discovered are no more than 1.3 billion light years away. They detected 305 galaxies in their survey with black hole masses less than 300,000 solar masses. Observations with Chandra and with ESA's XMM-Newton of a small part of this sample show that about half of the 305 IMBH candidates are likely to be valid IMBHs. The masses for the ten sources detected with X-ray observations were determined to be between 40,000 and 300,000 times the mass of the Sun. IMBHs may be able to explain how the very biggest black holes, the supermassive ones, were able to form so quickly after the Big Bang. One leading explanation is that supermassive black holes grow over time from smaller black holes "seeds" containing about a hundred times the Sun's mass. Some of these seeds should merge to form IMBHs. Another explanation is that they form very quickly from the collapse of a giant cloud of gas with a mass equal to hundreds of thousands of times that of the Sun. There is yet to be a consensus among astronomers on the role IMBHs may play. A paper describing the COSMOS-Legacy result by Mar Mezcua (Institute for Space Sciences, Spain) and colleagues was published in the August issue of the Monthly Notices of the Royal Astronomical Society and is available online. The paper by Igor Chilingarian (Harvard-Smithsonian Center for Astrophysics) on the closer IMBH sample is being published in the August 10th issue of The Astrophysical Journal and is available online. With all the mysteries of the universe is it possible that Black Holes, Dark Matter et. al. and other universe residue? -is it possible they are just "regathering" over billions of light years to generate another Big Bang? Most of the colored dots in this image are black holes. About 410 million to 11.0 billion light years from Earth. 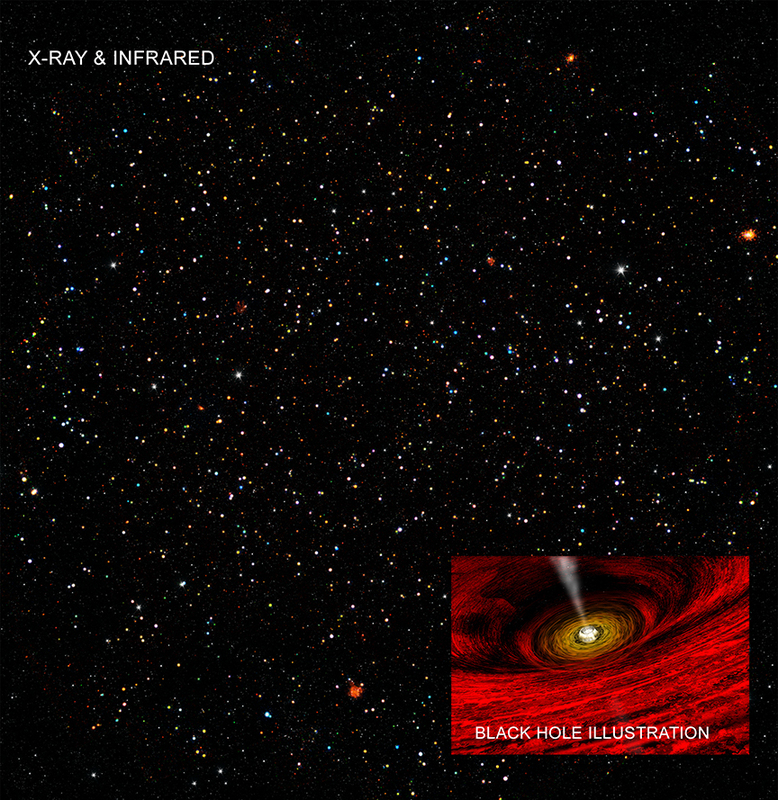 X-rays from the Chandra X-ray Observatory and infrared information from Spitzer Space Telescope. The image is about 1.5 degrees on a side. X-rays are red, green, and blue. Infrared is grayscale.